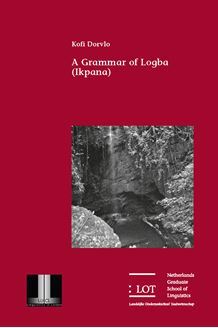 This book presents a comprehensive description of the grammar of Logba, one of the fourteen Ghana Togo Mountain (GTM) languages spoken by approximately 7,500 speakers on the South Eastern frontier of the Ghana Togo border. It is the outcome of fifteen months research in Logba speaking communities. The grammar covers phonology, morphology, syntax and aspects of pragmatics such as routine expressions, particles and interjections. The language displays three interconnected systems of nominal classification prefix classes, singular plural pairings and agreement system. The interaction of external verb agreement and noun phrase internal agreement results in nine different agreement patterns. Other typologically interesting features of Logba accounted for include its two adpositional classes, verb serialisation with features marked only on the first verb, and the coding of topological relations in verbs. The influence of Ewe, the dominant lingua franca, on the grammar and lexicon as well as Logba’s differentiation from its presumed genetic relatives like Likpe and Lelemi are touched upon. A corpus of glossed and translated texts which was used as data sources as well as a trilingual wordlist are also included. This book is of interest to specialists in African linguistics, linguistic typology as well as contact linguistics.